BANGOR — Many business owners that use heavy machinery can tell you that equipment fires are a very real fear. The equipment is used hard, runs hot, and is sometimes operated in hard-to-reach areas. Besides the dangers to operators and passengers, an equipment fire could have an impact on an entire business. If one piece of equipment goes down, the entire operation could come to a halt. Protecting that equipment is of important concern to owners. 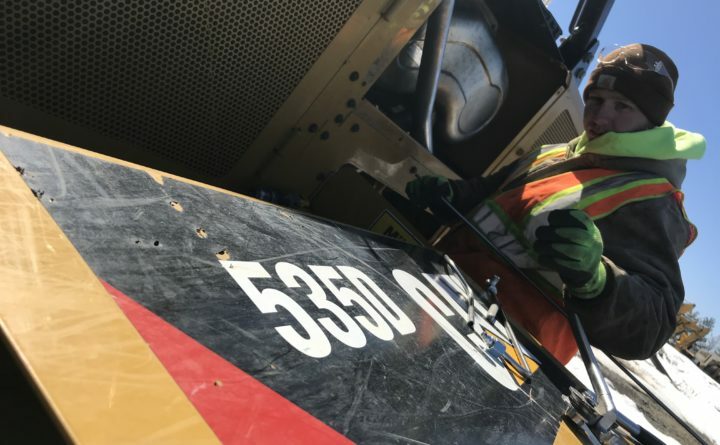 Fortunately, in recent years, technology has entered the market that helps protect heavy equipment and the lives of its operators and passengers. 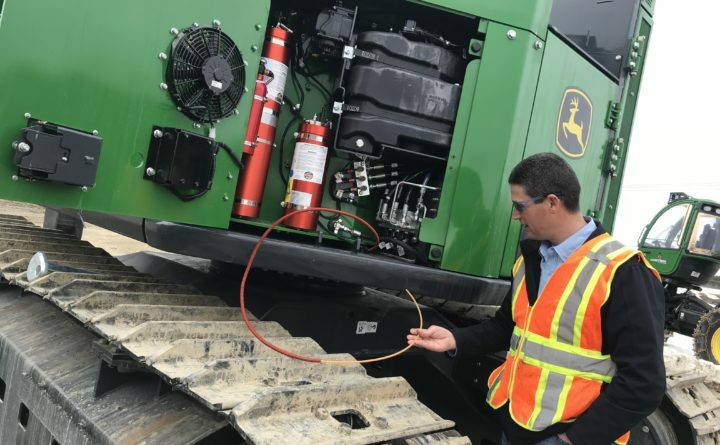 It’s called “automatic fire suppression”—essentially a fire-fighting system that lives in the engine compartment of heavy equipment, where many fires start. Recently, one Bangor-based company, American Loggers Fire Suppression, began installing the systems on heavy logging equipment throughout Maine and nationwide. Logging equipment is at particular risk of catching fire—the hot engine compartments are susceptible to collecting flammable debris from their logging operations, said Brad Johnston, the company’s general manager. ALFS, which derives its name from the popular “American Loggers” television series set in northern Maine, is itself an offshoot of American Loggers Insurance. That company, a nationwide insurance agency serving truckers and forest products industry workers, was started in 2010 by Tim Varney, owner of the Bangor-based Varney Agency. While most automatic fire suppression systems use a dry chemical (or a combination of dry and wet chemicals) to interrupt the elements necessary for fire, ALFS installs a system that’s unique from others on the market, said Johnston. That’s because ALFS’ system uses a water mist with only a 3% mixture of AFFF, a component-coating foam; it does not require any power for system activation; and it has a complete discharge regardless of the position of key components. Johnston said this provides a unique advantage over chemical-based systems—it reduces the possibility of the fire reigniting due to heat. It’s also environmentally-friendly, nontoxic to humans, and easy to clean up. The physical system, produced in Sweden and called Fogmaker, is fairly new to the U.S. and is licensed exclusively to ALFS for forestry throughout the entire United States. Through the evaporation process, one liter of water forms 1,700 liters of water vapor. Johnston said the Fogmaker system is the only system that attacks all three components of the “fire triangle”: heat, oxygen, and fuel. While the discharge of many powder-based systems will last 10 to 20 seconds, according to ALFS, Fogmaker discharges from 45 seconds to about a minute and 15 seconds—important to ensure that hard-to-reach areas are covered and to cool the engine down below the flash point. Many major insurance providers, including Maine-based providers like American Loggers Insurance and Acadia Insurance, grant benefits to loggers using fire suppression systems, said Johnston—the insurance rates in some cases can be much better with installed automatic fire suppression, as the providers seek to protect their investments. In fact, said Johnston, ALFS has yet to experience a total loss on a machine with Fogmaker installed and serviced by ALFS. Johnston said there’s another growing area of use for systems like Fogmaker—school buses. This past February, a school bus carrying staff and students from Hermon High School caught fire on Interstate 95 in Orono (the bus’s occupants were evacuated and safely accounted for). Less than a month earlier, a school bus in Sterling, Massachusetts caught fire after its driver left it with the engine running, according to the Boston Globe. In fact, in the U.S., school bus fires happen a little more than once a day, according to a 2016 report commissioned by the U.S. Department of Transportation. While injuries and fatalities in these incidences are thankfully low, the costs are not—on average, each fire results in about $28 thousand in property damages. Automatic fire suppression systems have yet to be installed on school buses in the Bangor region, but it’s happening elsewhere—as recently as February, a charter school district in Texas serving about 16,000 students installed Fogmaker in all 16 of its buses. While Fogmaker systems aren’t currently installed on school buses here, Johnston said he has been in touch with local superintendents and fleet owners. And with multiple applications across an array of vehicle types, there’s no telling where you might see these systems next, protecting both lives and livelihoods.